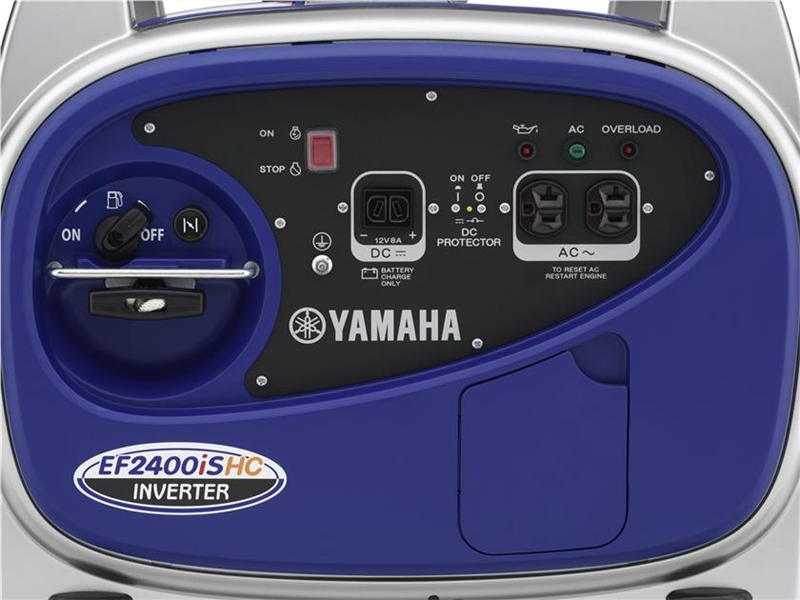 The EF2400iSHC inverter combines light weight and the latest technology to produce the highest output in its class. High Current output — Increased motor starting capability and improved air conditioner starting. This High Current model starts most high efficiency 13,500 btu AC in temperatures up to 110° F.
Pulse Width Modulation — Provides power that is as clean, or cleaner than commercial power. Smart Throttle feature — Adjusts the engine speed to precisely match the load. 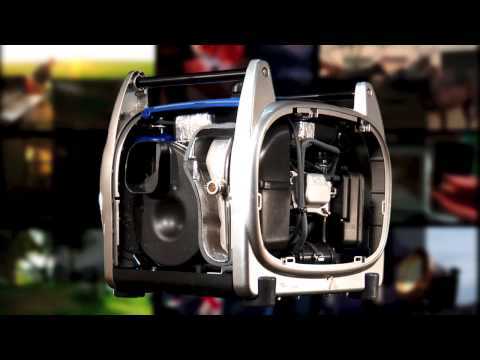 Oil Watch Warning system — Prevents engine damage caused by low oil, avoiding costly repairs and minimizing down time, adding customer confidence and peace of mind. OHV engine — Improved efficiency, increased reliability, quieter operation. Compact and lightweight — Easy portability. 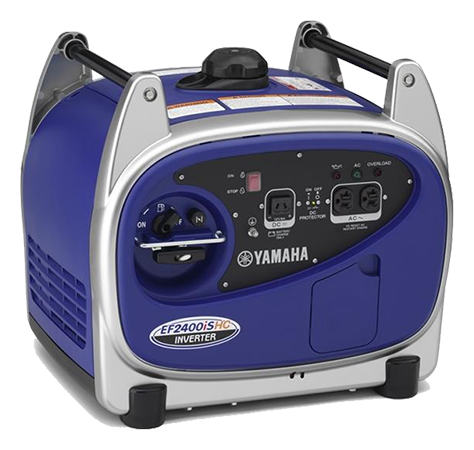 Versatile power in the silent, 2000-watt class — Will run most 13,500 btu RV air conditioners, microwave/convection ovens, or even the biggest hair blow dryer. 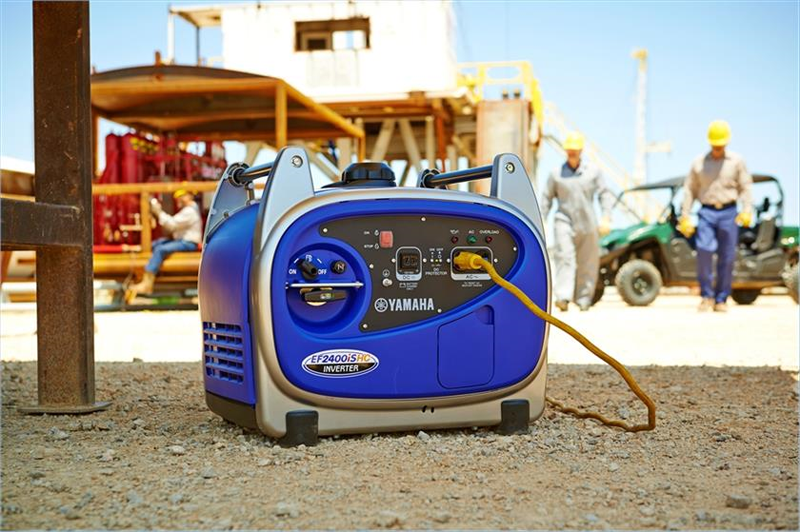 Engine speed at full load (2400 watts) is only 3400 rpm — Quiet operation. Cast iron cylinder liner— Provides long engine life and consistent performance during continuous use. Removable back access panel — Easy servicing. Fuel gauge — See fuel level at-a-glance. Aluminum die cast frame— Strong yet lightweight. Gasoline petcock lets you shut off the gas to run the carb dry for storage — Prevents stale gas problems. 12 volt DC cable is included as standard equipment — Charge RV, ATV, motorcycle, marine, and automotive batteries. 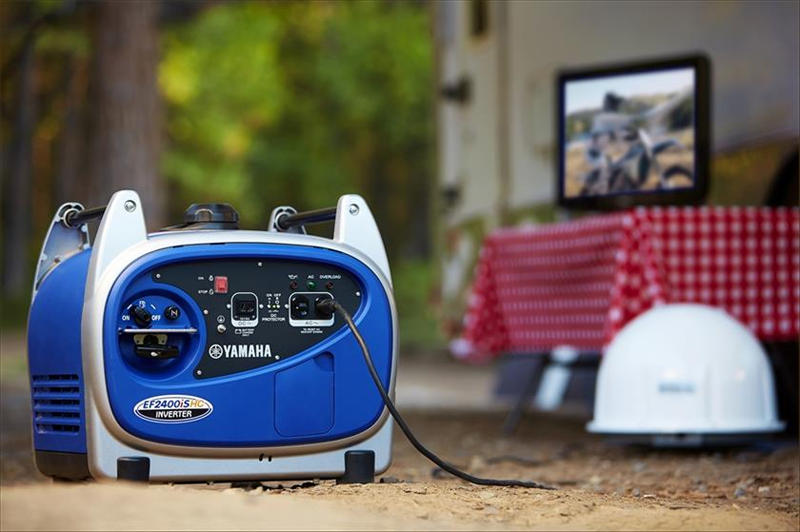 EPA & CARB Emission Engine Durability Rating — Yamaha generators have the longest emission engine durability ratings issued by the Environmental Protection Agency and the California Air Resources Board. 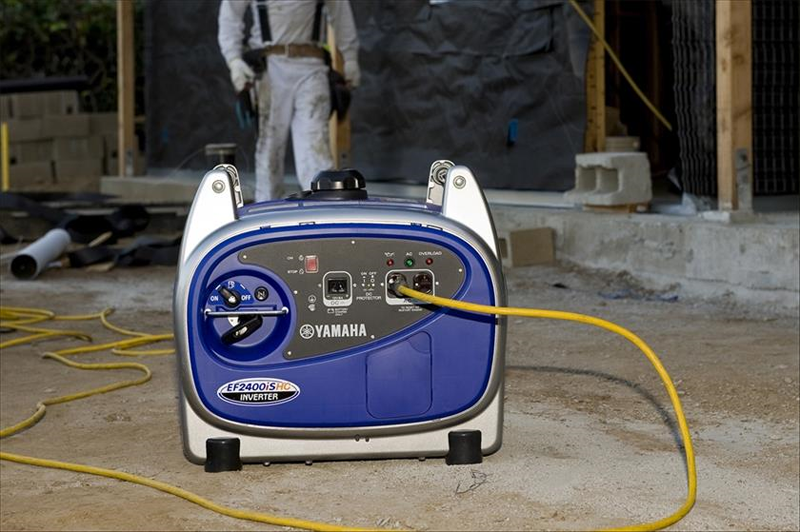 Fuel gauge allows fuel level to be seen at-a-glance. 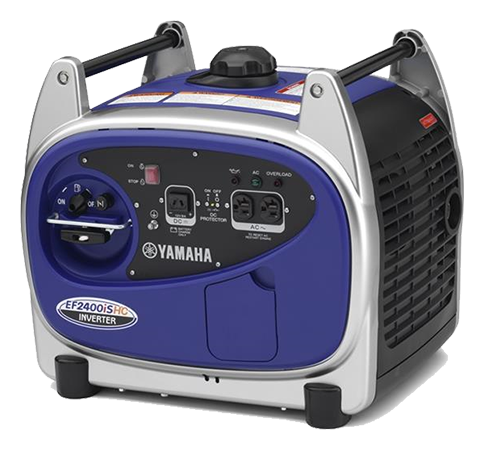 This model boasts High Current output which is designed specifically to increase motor starting capability and to improve air conditioner starting. 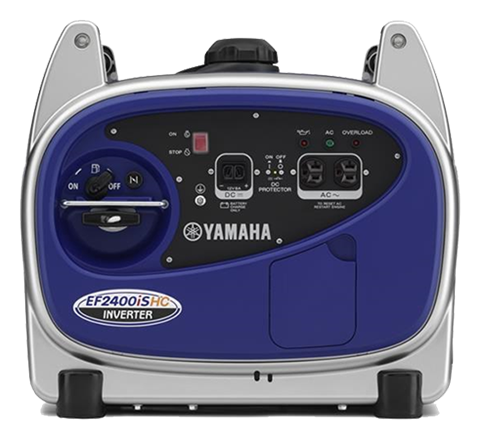 This High Current model starts most high efficiency 13,500 btu AC in temperatures up to 110° F.
The EF2400iSHC has an aluminum die-cast frame, combined with an aluminum TCI rotor and other weight-saving measures to provide a powerful and compact generator weighing only 75 pounds. 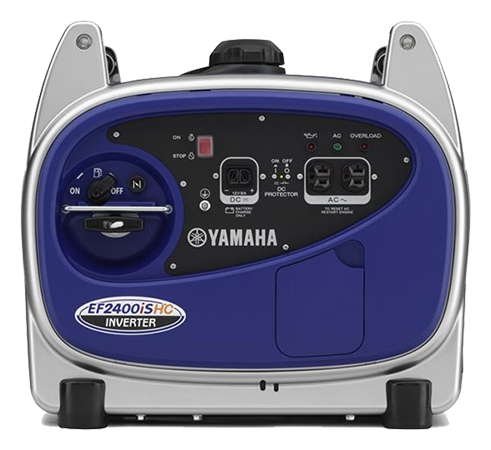 The EF2400iSHC uses Pulse Width Modulation (PWM) to produce high-quality electricity comparable to the power supplied by public utilities. 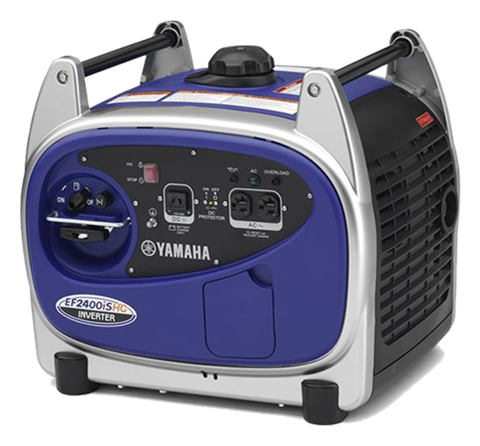 Use this generator with confidence as a power source for microcomputer-controlled appliances and other devices with built-in computer functions. 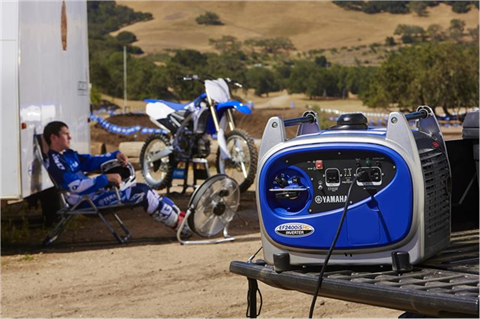 Yamaha’s Smart Throttle feature automatically adjusts engine speed to match the load. 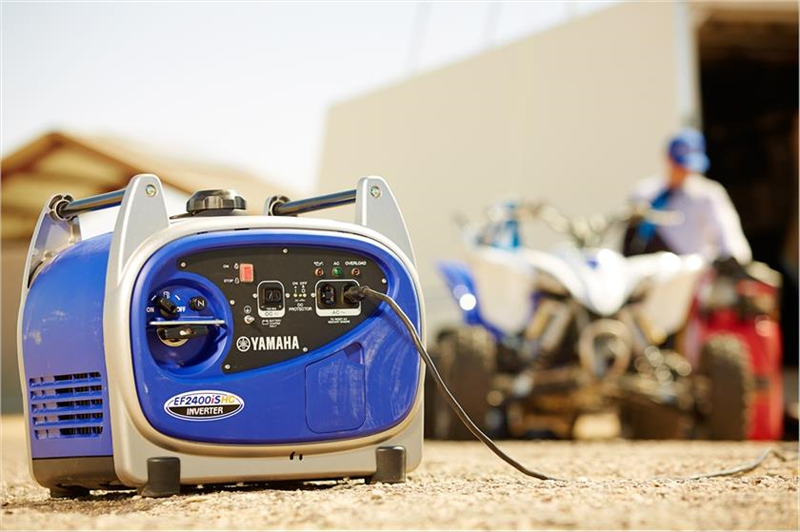 The result is quiet running, maximum fuel efficiency, and a run time of 8.6 hours at 1/4-capacity load.